Dear Fellow Cooks,There are so many different cooking guides on the market – some good and some bad. 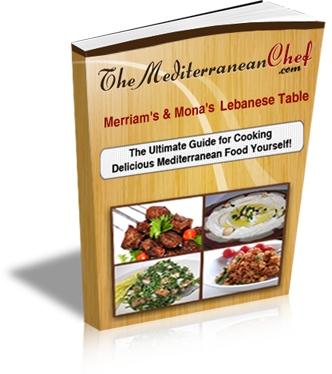 I would like to introduce you to our cookbook – “Merriam & Mona’s Lebanese Table“. When I was growing up in Lebanon, I remember coming home to my mother’s kitchen – it was a true delight. As soon as I walked through the doors, I smelled yummy food. Every time I have a taste of Lebanon, it takes me right back to my mom’s kitchen. While I was living in the New York and the New Jersey area, I hosted many dinner parties. During those dinner parties, I received many compliments. Many women do not like to share their recipes once they have mastered it. 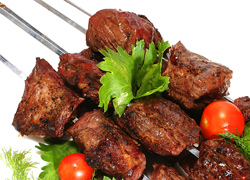 We, however, can’t wait to share “A Taste of Lebanon in Merriam & Mona’s Lebanese Table” with you. Even if you have never been to Lebanon before, we urge you to try at least one recipe out of our book – surely, you are going to enjoy it. Recipes by Mona and MerriamEach of these recipes has been developed by either Mona or Merriam. Two women have collided in order to create the ultimate cookbook full of recipes just for you.These aren’t your average recipes.Nope, these are not your average, every day recipes. You could try to find them online, but you probably won’t, because they are Mona and Merriam’s very own recipes. 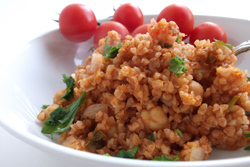 They decided to share their recipes with you, because they want to bring a little piece of Lebanon to your table. There are many different types of recipes in this eBook! The soups are delicious and perfect for those cold winter days (they’re also perfect for hot days). The salad dressing recipes are out of this world! The salads – well, they are not your average salads! You think that food sounds delicious? You should see the other recipes that are in the cookbook! Each one of the recipes are easy to follow. We give you step by step directions in order to make sure you get it right. As long as you follow the steps and take the proper measurements, your food should turn out as delicious as ours. Each one of the recipes in this cookbook is presented by a picture of the food once it is done. This way, you will see just how yummy it looks. It’s true – if you are a woman trying to win a man over, cook him a good dinner. Men love it when a woman can cook. Don’t waste your time on those recipes on the Internet – they are not always accurate. Our recipes in our book are accurate – we know this, because we make them ourselves. Ladies, your man will be surprised with the stuff you can come up with out of this book! This book isn’t just for ladies though – many men purchase this cookbook in order to cook a good meal. Regardless of your gender, this cookbook deserves to be in your kitchen. It’s time to purchase this eBook and start enjoying good food. 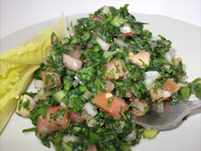 “Merriam & Mona’s Lebanese Table” has a little bit of something for everyone.